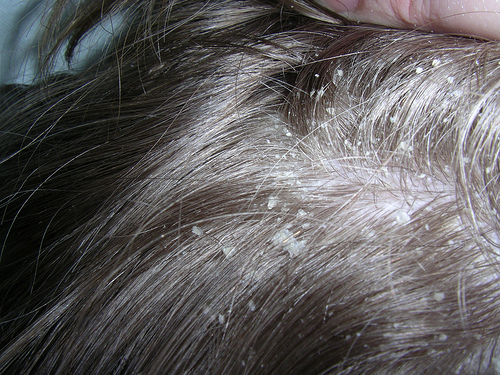 Dandruff is a common skin condition that causes dry white flakes of dead skin to appear in the scalp. It can occur due to dryness, oily skin, sensitivity to hair care products, bacterial infection and various skin conditions. While you can always get rid of dandruff by using over-the-counter dandruff shampoos, there are natural dandruff treatments that you can try at home. Neem leave is a powerful natural antiseptic that is used in various skin problems. Neem leaves can treat the scalp infections that causes dandruff. Boil a cup of neem leaves for approximately half an hour. Next, grind them in a mixer so that a paste is formed. Apply this paste all over scalp evenly. Once the paste becomes dry, rinse it off with a mild shampoo. Aloe vera Gel is used in traditional medicine as a multipurpose skin treatment. Aloe Vera contains a natural anti-fungal property that help to get rid of dandruff. The natural enzymes found in aloe vera can moisturize the scalp, helping to remove the scaly dryness that causes dandruff. Cut the aloe vera leaf from the stem upward and remove all the gel. Apply it to wet hair and scalp. Massage gently and leave it for 2 minutes. Wash your hair as usual after the treatment. Apple cider vinegar is effective in treating dandruff as it restores the pH balance of the scalp, thereby preventing the growth of yeast. It also works as a natural hair clarifier and helps clean clogged pores and hair follicles. Mix one part of apple cider vinegar with equal part of water and add 15-20 drops of tea tree oil in it. Wash your hair normally and then apply the mixture to wet hair. Massage gently with this mixture. Rinse your hair after a few minutes. Baking Soda is alkaline in nature and helps to exfoliate the dead skin cells. It also helps in controlling excess oil secretion on the scalp. Wash your hair with warm water. Add a few drops of water in baking soda to form a paste. Apply it on the scalp and massage for a few minutes. Rinse your hair with plain water. Do not shampoo your hair after this treatment. Curd rich in vitamin B5 and proteins that helps in moisturize the hair. The acidic quality of the curd helps combat dandruff. Take a small amount of white sour curd and leave it in the open for a day for fermentation. Whisk the curd and apply it to your scalp and hair. Leave it on for an hour and then rinse it thoroughly with a mild shampoo. Please Share!! Sharing is Caring!! !